I like this trade for both teams. The auction proved once again that most of the assets are overpriced and not that good, otherwise the players would have been kept. 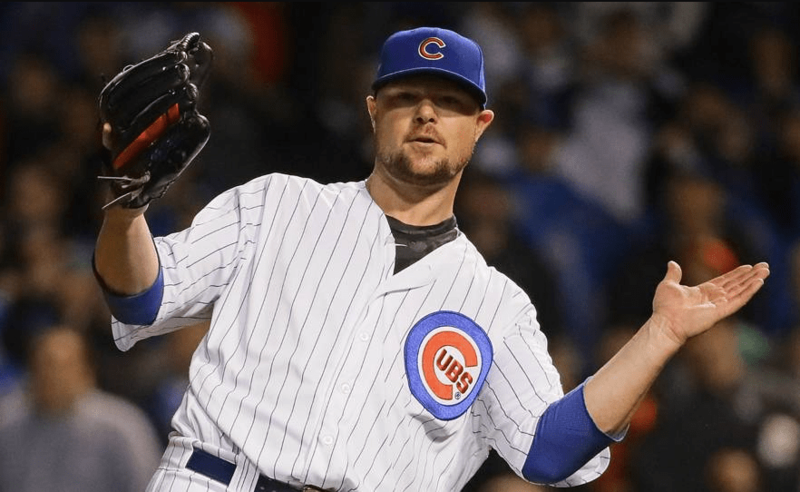 $63 Jon Lester has proven to be one of the better auction purchased, which says a lot about a lot. He’s a top 30ish pitcher pitching even better lately. He was keepable for close to that price, but Jordan decided to cut him. At 3-7, Hydra has clearly thrown in the towel, not even Freddie Freeman is eligible for their lineup every day. Getting two keepable assets and betting against Lester being a keeper at that price seems reasonable. Hydra has no real catcher, and with Gattis turning the corner he’s a justifiable keep if he’s playing most days. They will have the rest of the year to decide whether or not to keep Godley, but in all honesty, $10 on even an average pitcher isn’t awful. It’s clear Bailey had become increasingly frustrated with Godley’s consistency, and perhaps used his last start as a sell high of sorts. The short lived Godley Income era is now over. Getting two major league assets for a guy you weren’t going to keep seems fine. If anything, Hydra has proven to be able to spend big chunks of money on players in auction and be successful about it, so maybe they find next year’s Lester who helps them place/win or sell him off again. Lester was probably a better purchase than anyone I got in auction for instance. I don’t love that they threw in a 2nd rounder, but relievers will be available later in the draft too. Fast forward to yesterday and, well, to be fair, Alex said these guys were on the block. He just didn’t say they were going to be given away for free. Two of my first thoughts upon seeing this trade were that (a) Aaron Hicks is the best piece going to Hydra, and (b) Tommy Pham may as well be the same guy. I did a quick Google search and here’s some random Cardinals blog that thinks the same thing. So there’s that. Hicks is hitting at a 1.644 PT/PA clip, whereas Pham is at 1.502. Pham’s older and has one less outfield position. They were both free agent adds that will start at $5 salary next year. They just feel very same-y to me, to the point where if one is your main piece and you’re giving up the other, the point feels a tad defeated. I really didn’t think David Price was going to go for much. He’s got a lot of mileage, has developed a homer problem (who hasn’t? ), and there are lingering injury concerns. Also, he’s been pretty bad this year. At $77 next year, I think he’s an easy cut or Hustle will just give him away the moment the season ends and clog up some other team’s budget. I thought he should’ve been cut this year (pre-injury). So whatever team bought him was likely doing it on a rental basis, and I just didn’t see teams spending big to rent anyone. I thought maybe a pick and a prospect would get it done. In that vein, I don’t think sending Collins or Alvarez, or maybe even both, for Price as a rental is that bad on its own, assuming you really believe Price can get it going and help your team this year. 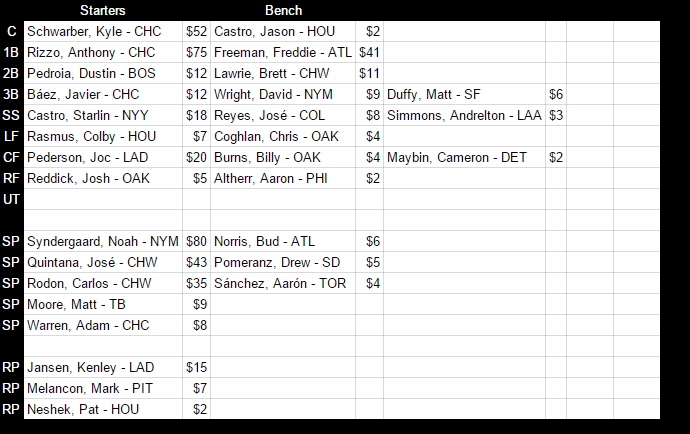 Given the pitching landscape, gambling on Price seems like a reasonable bet. So we haven’t even gotten to the big gun in this trade, and I feel like Hicks and Pham have cancelled each other out and a moderately valuable Price has fetched a couple pieces. There aren’t a ton more assets floating around here. As for Arenado, well, I’m not sure all the pieces going to Hydra is enough for him alone. He’s expensive, sure, but he’s young, in his prime, plays a premium position, and plays in Coors. His salary is only going to go up by $2/year. That’s nothing. He’s a superstar, priced reasonably at $73 next year, and yet he didn’t land someone universally viewed as an “elite prospect”? I mean, maybe you think Yadier Alvarez is. That’s fair. Everyone’s prospect valuations are different. But he’s pitched 45 innings at A+. The lead time on him is a factor and that assumes that he dodges injury and experiences no developmental speed bumps. He’s already struggling with command this year. And I like Zack Collins as a hitter, but if he doesn’t stick at catcher, a lot of his value will be sapped in a world where Ryan Zimmerman, Justin Smoak, Yonder Alonso, Mark Reynolds, and Logan Morrison are awesome and can be had for free. Heck, the Braves are moving Freddie Freeman to third base (I imagine this factored into Hydra’s long-term calculus for moving Arenado) to make room for Matt Adams‘ bat. First base is not lacking for depth. And the cost control aspect is neat but if Collins is $1 and Alonso gets greeded up to like $5, is that really significant value? If he does stick at catcher, that might push his MLB ETA out further. Again, for me personally, Alvarez and Collins are guys you can afford to spend on a rental player or two or just a quality lineup upgrade, not really key cogs to dealing a stud. And those picks are… something? It’s going to be a late first rounder and a pick somewhere in the second round, but this year’s MLB Draft class was weak. Looking at last year’s draft, I feel like around the 11th or 12th pick is where it started really being a coin toss. The first belongs to Hustle and the second belongs to Haddy. Today, that’d be pick 16 and pick 27, I think. You can definitely land good talent there, but your odds of whiffing also go up considerably the deeper you go. Look, I won’t argue anyone’s prospect evaluations. If you think Collins is going to be a star and Alvarez is going to quickly develop into an ace, awesome. I definitely think, at least in Collins’ case, he’s a better fantasy prospect than real life prospect. But I don’t really know. I doubt you know either. We’re all making our best guesses. But I really do have a hard time imagining that, in terms of prospect currency, no one was willing to beat Alvarez and Collins even if, as the buyer, you’re super high on them both. 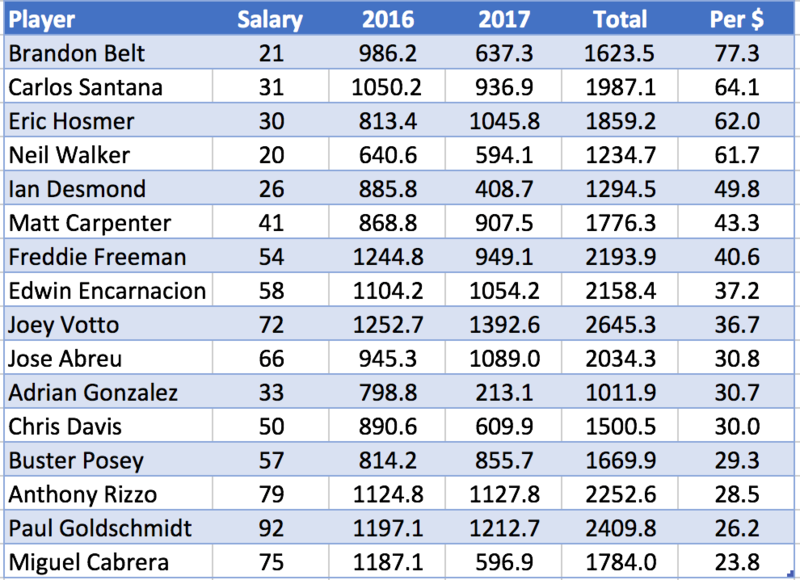 Arenado’s not some declining veteran, win-now salary sell off. He’s a player that even if you’re at the bottom of the standings, you should probably be in on. I’d be curious how many teams even inquired here. 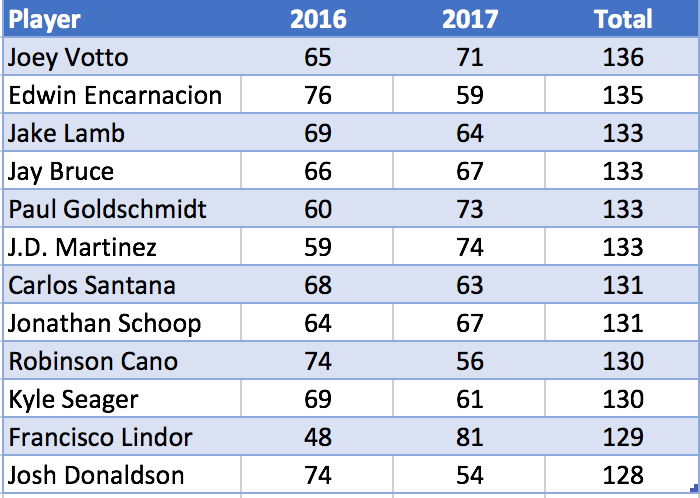 In terms of dynasty rankings Collins and Alvarez are… top 50? Maybe top 30 guys? (The rankings are irrelevant, of course. I don’t recall Bellinger being an “elite” guy a year ago.) I’m not sure if HLR had added Vladimir Guerrero Jr to this package it’d still feel totally right, but it’d at least be closer. At least then there’s a consensus “elite prospect” in the mix. There’s no telling how this will play out. If the prospects turn into anything decent, Hydra’s probably content. I think some of it will depend on if teams sell players at discounted prices in the off-season like last year, at which point Hydra can put some of the cap space they’ve freed up to use. I know Hustle’s probably thrilled to just plug in Arenado every day instead of oscillating back and forth between Yuli Gurriel and Nick Castellanos. Jordan’s thoughts: This deal on paper makes a lot of sense. Hydra was dying for a first baseman, the unluckiest team in the league could use an upgrade at catcher and pitchers are always useful. After sitting on the trade for a couple hours I think both teams improved themselves in this trade. Freddie Freeman is nearing enigma status. In my head a keeper at $40 makes complete sense. FanGraphs projections has him hitting 1.41 PPPA going forward. That’s pretty legit. Based on how things have been going, IL4W has really improved the team in a lot of ways. Based on projections, it appears to be more of a lateral move. I still love it for them. For HYDRA I love the deal as well. Lucroy was not really doing enough for them. Freeman, as I said, projects to be better. That’s a pretty significant upgrade. Selling depth for a significant upgrade with easy keep-ability makes total sense. It’s actually kind of hard to break down a trade like this. I think both teams win. Based on projections Team Hydra significantly improved their team. Based on past results, IL4W has significantly improved their team. At the worst in either direction, they didn’t hurt their respective teams. It’s a win-win. Andrew’s thoughts: I guess the simplest way of putting it would be this: I’d rather be the side getting Lucroy and Hill. I’ve given Alex from Team Hydra a hard time before about Lucroy, but the truth is, he’s a really good player and $25 isn’t bad for the second best catcher behind Buster Posey. I’m just not personally into paying premiums for catchers and whenever he and I spoke about a move involving Lucroy, I felt like that’s what I’d be doing. I didn’t really believe Lucroy was keepable at $27 next year, but there’s a good chance I was wrong about that. Of course, this deal makes fundamental sense for both sides. Team Hydra has Posey, so Lucroy is a tad redundant at catcher. They also have Prince Fielder disappointing at first, so there’s an apparent hole there. In Line 4 the Win, meanwhile, has Anthony Rizzo at 1B but had been plodding along with Jason Castro, so you see where the pieces fit. Anyway, I’m a big proponent of playing players in the position where they are most valuable. Posey, obviously, is more valuable at catcher. But in this case, I think I’d rather just shift Posey to 1B and play Lucroy at catcher than bring in Freeman to man first until Lucroy logs two more games at first, at which point he’ll have unlocked that position. As of today, Lucroy has a higher wOBA by .028 points and ZiPS sees Freeman playing out the year with a .023 edge there. I’m not really sure I see a huge performance gap between Lucroy and Freeman heads up. These two guys are close enough that it probably didn’t warrant dumping Hill, a 30+ point per game starter at this juncture, just because Team Hydra has an abundance of pitching. Getting Hill as essentially a throw in is just good work by IL4W. Too much pitching is a gift, not a curse. The other pieces involved are negligible. Phegley is an okay lefty mashing catcher, but he’s hurt and because he really only hits lefties, he won’t be playable most days. And even when he’s facing a Southpaw, you won’t bench Posey for him. He’s being viewed as depth though (he’s Hydra’s only other catcher now), I’m sure, so he’s fine. And the third round pick is an alright bonus too, just not a piece that really factors in much. And with great giant lightning bolts, the team wins their super hero, their Thor. Holy cow what a bid. I mean there’s probably cause for Thor costing $80, but holy Norse God he is still young and fresh. Here is the league’s token all upside team. It does not typically work for me, but if it works for IL4W. I am not certain I actually know anything. Kyle Schwarber could have been the steal of the draft for 2016. Being a qualified catcher playing every day in the outfield. However, at $52 you’re looking to see him be as good as we was last year for an entire season. It is clearly possible, he could be better, but IL4W paid for it. Anthony Rizzo at $75 seems like a great price to me. Is Starlin Castro back to for real now? Joc Pederson is an enigma much like Colby Rasmus. Should be awesome, but um something’s not right. Dustin Pedroia and David Wright offer yesterday’s stars as older staples that in a day to day shuffling, should offer higher floors. Freddie Freeman being hurt before the draft could have dropped him into value territory. There is just enough question marks over the whole stack that I settled on alright. Something is missing here. Noah Syndergaard is a tier 2 with tier 1 potential. Jose Quintana is a tier 2 that everyone wants to believe is a tier 4. Carlos Rodon getting paid $35 means he needs to be awesome soon. Matt Moore as your 4 is scary. The top half just isn’t good enough to get behind and the bottom half is even scarier. It clearly could work out, but I’m missing what that is to make this rotation great. Bullpen should be good though. Kenley Jansen and Mark Melancon should be reliable stable relievers, as they come anyway. There is a plethora of decent talent that can be flexible and move around on this roster. The hitting depth is great, but the pitching depth drags this down quite a bit. Jose Reyes is a huge question mark, but at $8, possibly $10 next year is an exciting gamble. Guys like Matt Duffy, Brett Lawrie and Billy Burns could all finish high enough to start by the end of the year. They all are a small hot streak from being good enough to flip for something even more interesting. All of that upside could be egg on this teams face. Sure, it is exciting, the possibility of being right and awesome on young guys in a dynasty league is incredibly tempting. Just like a few other teams, this team is currently built for everything to go right, or its on to 2017. Well Syndergaard, Quintana and Rodon obviously blow away expectations. The hitters are good enough, as is, to carry. They need these pitchers to be at their friendliest projections. Rizzo and Freeman could battle each other out for National League Silver Slugger, Joc Pederson gets his head on straight. Lots of upside here, it’s all over.